View cart “Basketball Skills & Drills 4th Edition PDF” has been added to your cart. Before you can make that winning buzzer beater, you need to master fundamental skills in all phases of the game. The fourth edition of the best-selling instructional resource Basketball Skills & Drills provides the perfect blueprint for building the foundation that all well-rounded players and championship teams need. Recognizing that individual skills are effective only when used within the team concept, the book also covers team principles for both ends of the court. Tactics for offense, including special situations for out-of-bounds plays, will improve spacing, ball and player movement, shot selection, and scoring. Defensive tactics emphasize positioning, pressure, and various systems to apply in each zone of the court. At all levels of basketball, success comes with mastery of the basic skills. 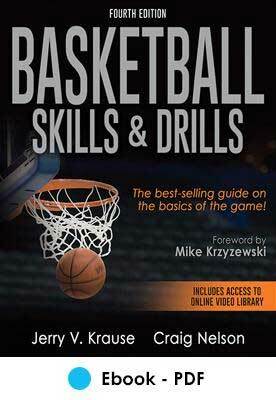 Basketball Skills & Drills is your best-selling guide to becoming that dominant force on the court.